High quality hard anodized aluminium gear, on precision ground shaft. Manufactured by T2 Racing in Japan. Direct replacement for the standard plastic shaft/gear which is prone to cracking and causing catastrophic failure. 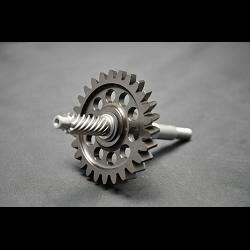 The shaft and gear can be disassembled should any parts ever need replacing.